Last weekend, my colleagues and I took a very special field trip to Northeastern Oregon to visit GROWISER, a native plant conservation area in the Grande Ronde Overlook in the Blue Mountains. One of the owners of Joy Creek Nursery grew up nearby and was most happy to have discovered this amazing place and then to share with us. Stay with me now for a short but sweet snapshot of this very precious piece of paradise. 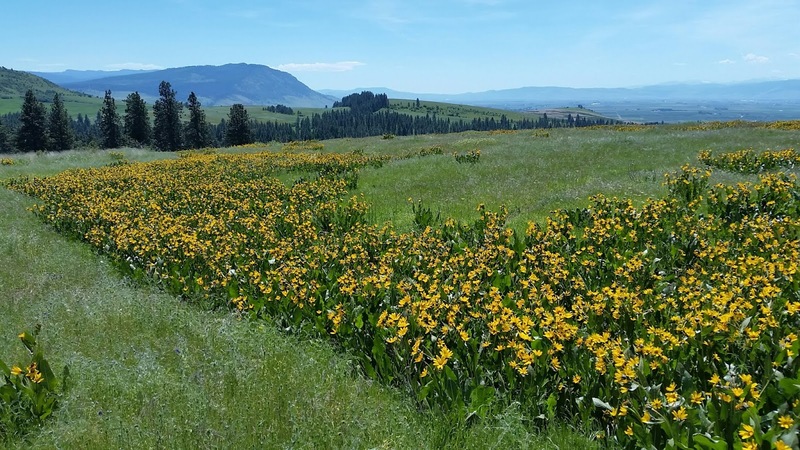 GROWISER stands for the Grande Ronde Overlook Wildflower Institute Serving Ecological Restoration. The area is 260 acres that has been lovingly restored to a pre-agricultural state of wildflowers atop volcanic bluffs along with woodland and scrub land in between. Here, mule's ears or Wyethia amplexicaulis is still blooming along the edge of what the owner Andy Huber told us is the edge of an extinct volcanic crater. Volcanic ash lies just underneath, you can see where it stops and the flowers and deeper soil begin. Here he is! Dr. Andy is what I call him. He is a former Eastern Oregon University agronomist or seed scientist. What an amazing man. He's been at this for some 27 years, ready and willing to share this land with all who wish to learn about it. He regularly hosts groups and tours, most importantly local school kids visit and learn from the kindest, most generous man you could imagine. It began in 1993 when he began to acquire land in this region, an area he believed to be worth saving for all to appreciate ecology. To Andy, ecology is about connections, and his mission is to connect people to nature. With 206 native species on this land, there is something for everyone. I should mention that Dr. Andy has managed to ammas the largest rock collection I have ever seen. More on that later, but here are a few of the outdoor rocks and crystals placed throughout the property. Wait until you see what he has at the field station. Here it is, you can see a tiny sampling of the collection on the deck here. More crystals at the end of this post, so read on! OK, on to the flowers. Our group met in the morning and went out first through the woods. 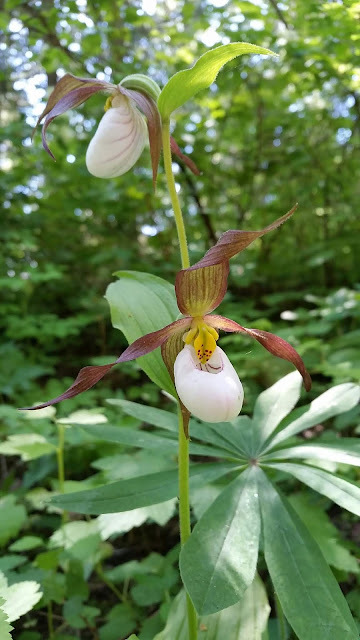 Andy pointed out many flowers to us - pictured is Mountain lady's slipper or Cypripedium montanum, a native orchid. Andy found they grew on his property and began propagating them from seed. They take several years to bloom, so it was especially fantastic to be able to see groups of them in full bloom. Our native woodland honeysuckle or Lonicera ciliosa with Physocarpus malvaceus or mallow ninebark, a close relative of our native Physocarpus capitatus or Pacific ninebark. Sticky purple geranium or Geranium viscosissimum. Arnica cordifolia or heartleaf arnica. This is a native grass Calamagrostis rubescens or pinegrass. It carpets areas of the open forest floor, creating a wonderful texture. I wonder if it would be a good shaggy lawn substitute. Apparently it rarely flowers in shade. Our native columbine, Aquilegia formosa. On the edge of the woodlands, large Physocarpus malvaceus grow especially well. Thermopsis montana, which I have growing in my garden. A few years ago, Maurice, my boss at the nursery, collected seed and propagated it for the nursery so we have it for sale which is where I initially learned about this plant. It's nice to see it in the wild. This lupine is a surprising white color, perhaps a faded Lupinus sulphureus. Elegant mariposa lily or Calochortus elegans, a very strange and wonderful plant. A Castilleja species, perhaps C. miniata or Indian paintbrush. More native orchids: Summer coralroot or Corallorhiza maculata. This is Corallorhiza striata or hooded coralroot. We spotted a crazy tree that some in our group suspected was manipulated by Native Americans to form a marker of some kind. Whether natural or manipulated, it's just cool. Remember I mentioned rocks? This is just a 1200 lb. piece of smoky quartz from Brazil. And it's in the woods. For all to enjoy. Moving away from the forest and into the open meadows atop the mountains, this very blue penstemon, Penstemon pennellianus, really stands out. Triteleia grandiflora or large flowered triteleia. Foliage of Balsamorhiza sagittata or arrowleaf balsamroot is quite attractive and everywhere up here. These are flowers of Wyethia amplexicaulis. Can I vent for a moment? There are more yellow aster-like wildflowers out there than I can count . . . it can get quite confusing and frustrating. In any event, even though these look like balsamroot, they are not, I was told. See, that's the beauty of a trip like this. I know native plants specific to my area, but this is an entirely different eco-region. It's fun to learn and grow, no matter the frustration of keeping it all straight in my head. Cones of Larix occidentalis or Western larch. Here is the full tree. He planted many at the same time side by side and some are obviously much larger than others. He explained that the soil depth has a lot to do with the success of any of the trees and shrubs he plants as shallow soil atop volcanic rock is not conducive to healthy growth. Here we are, trekking along on a very happy afternoon. Triteleia grandiflora or large flowered triteleia once more, nearly finished blooming but still interesting. Oregon checkerbloom or Sidalcea oregana. Clarkia pulchella, sometimes known as pink fairies. Buckwheat, these next few photos are all Eriogonum heracloides. Much of the grassland is made up of this, Idaho fescue or Festuca idahoensis. It gives the land an almost soft blue cast that makes the pine trees really stand out. Another outstanding grass, Leymus cinereus or basin wild rye. It stood a couple feet taller than the fescue, and in large clumps, it really caught the light. This is the transition zone between meadow and forest. The trees in the foreground were newly planted Ponderosa pine. Potentilla glandulosa or sticky cinquefoil. The sun and Wyethia amplexicauis or mule ears. Mount Harris in the distance. I don't know who this is, but he/she was incredibly curious or perhaps it was attacking me. It reached out swinging its legs when the camera got close. A labyrinth, of course, with a surprise crystal center. Moving along after our break, Dr. Andy mentioned this downed tree is a favorite of wildlife, so he left it for them. Apparently it came down in a storm a while ago. Moving along our merry way making our way back towards the field station for lunch we came across even more rocks and crystals in the landscape, some in the form of stone circles. What a treat. Here we have a miniature Stonehenge. Surprisingly, there are many such sites thoughtfully placed throughout the 260 acres. More Indian paint brush, this one possibly Castilleja hispida. Another large quartz crystal, this one near to the field station. Now for a very abbreviated look at the rock collection. I may not know my crystals and rocks any longer, but I know something spectacular when I see it. This is a meteorite, a bit of star dust, if you will. It's amazingly heavy and awe-inspiring. Even on the stairs in the background, there are crystals and rocks. They fill every room of this rather large station. Every room. This really is a small sampling of what he has amassed. I would estimate thousands of such rocks call GROWISER home. I have many more photos of rocks, but this is a garden blog, after all. There you have it, the abbreviated tour of a vast natural wonder. Take the road less traveled. This place is exceptional. Dr. Andy is an exceptional human. He has a huge heart only surpassed by his drive to plant 260 acres worth of native plants. Why does he do it? For us, for wildlife, for children to experience nature. That's dedication. He knows that ecology means connections in nature, he is therefore extending that connection between the plant world and the human world where all feels like it is in harmony. I thank him from the bottom of my heart for creating this life's work for the world to enjoy (and preserve) and for opening it up to our crew of fellow plant lovers. Our local public broadcasting station, OPB filmed an episode of Oregon Field Guide there, that can be visited by clicking this link. That's a wrap for this week at Chickadee Gardens. As always, thank you so much for reading and commenting, and if you're ever out in Northeastern Oregon, look Andy up. You'll be glad you did. What a cool place! It looks like you all had a great and informative day. Being out in the garden working is fun and restorative but being out in the middle of nature like this is inspiring and illuminating. We had a great time, indeed. I agree, being in nature is refreshing for the soul. What a fabulous place! Thanks for sharing your visit. I can't imagine a better place to live and work doing what you love. Dr. Andy is a lucky man and it'ss great to hear that he's deserving of that luck too. He is wonderful, Kris. This place is a gem on earth, to be sure. Happy to share it, I want the world to know how special it is. This is fabulous, glad to know about it! Thank you for sharing. You are so welcome, Valorie! Thanks for reading and commenting. I'm so very glad you enjoyed it. The crystals were an unexpected treat - well appreciated on this end. Thanks for sharing this love trip. Oh, crystals rock! (no pun intended..ok, maybe it was intended). I am most happy to share this magic place with the world - with rock lovers and plant lovers especially. What a wonderful adventure for you all to go on together! I must ask though, how does one get a 1200 lb. piece of smoky quartz from Brazil into the wilderness of NE Oregon? That's a great question. I think he said something like "a lot of hard work"...I'm still unclear how all of these got up here, but he bought them all himself. I think he must use a tractor, wouldn't you think? I loved seeing this place. I am not so familiar with the native plants in your area. It was good to see so many up close and in situ. I have to say when I saw the picture of you all walking through all that tall vegetation the first think that popped into my head was chiggers. Do you have chiggers in your area? To me they are more feared than Ticks. They can make one so miserable. Love seeing the bug too. You could probably spend the day looking at them as well as all those rocks. What a great collection of rocks. I can't imagine getting some of those huge rocks from so far away as Brazil. I thoroughly enjoyed this trip, thanks for taking us along. Thank you Lisa! I'm glad you enjoyed it. We do not have chiggers that I know of, but we do have ticks in grassy areas. We do watch out for them. By the sounds of it, we're lucky not to have chiggers. We saw so much wildlife that was difficult to photograph, it was quite amazing. I also saw a hive of bees swarming in the pine trees, that was super cool. So glad came along for the ride! What a wonderful place and how lucky that you got to visit. the native orchids were beautiful and all of those rocks and crystals are amazing. I love "fancy" rocks. A place to add to my list of "to visit someday'. We are so VERY lucky indeed. Those orchids are crazy. I recommend checking out the 8 minute piece of film I linked at the bottom of the post to see more about how he propagates these orchids. It's a labor of love, for sure. I hope you get to visit someday, too. What a cool field trip! Seeing our Oregon natural world beyond the usual Willamette valley sights is always wonderful, but seeing it with a knowledgeable and dedicated naturalist - perfect. Thanks for sharing, Tamara! What a wonderful trip, and great photos that show at least SOME of what I missed! I was sorry I wasn't able to come along. I hope we can do it again some time - that place is special for sure. So much beauty!! Well, some is right. It's worth the trek out there someday, Anna. I hope you can go. Mike wants to plan another visit.